It’s absolutely true that freelancing is an excellent way to make a living. Beyond providing the possibility for a substantial income, it grants the freedom and flexibility to live the lifestyle you choose. However, freelancers often enter the field with a mistaken notion of how challenging the work is. From invoices and client acquisition to miscommunications and contract issues, there’s no shortage of chaos to keep you busy. In this guide, you’ll begin your training, helping you transform yourself from a self-employed rookie to a tried-and-true freelance ninja. Instead, use email hosting that provides services such as archiving and look for companies that offer a high amount of storage space with your account. If you can respond to an email in less than two minutes, respond to it right when you read it. Many email services allow you to organize your messages into either “labels” or “folders.” This means you can more readily see the subject of a message, handle tasks appropriately, and find archived emails faster. As long as you have solid email hosting, you’ll have some sort of “message filter” option. This will allow you to have some portion of your inbox labeled, archived, and otherwise dealt with appropriately, all without expending any extra labor hours on your part. The inbox is the epicenter of your productivity world as a freelancer, but it’s not the only important place to wage a war. Scheduling is also an immensely important task requiring ninja speed, intelligence, and precision. The release of GMail priority inbox has also alleviated some off the weight off of filtering by yourself. What about schedule and calendars? 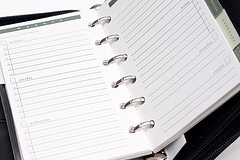 The good news is that scheduling is easier than ever before, since online calendars and scheduling devices remove the need for synchronizing between your computers and other devices. However, the bad news is that not everyone uses the same calendar, and most clients won’t want to register for whatever calendar services you use. Luckily, there’s another option! Tungle.me is a cross-platform calendar synchronizer that will allow you to schedule meetings, calls, or anything else with your clients. It will automatically retrieve information from your calendar, as well as your client’s, and it doesn’t require your client to register for a service. Plus, it’s incredibly user friendly. Once you have your inbox organized and your schedule solidified, you’re ready to strike down work as it comes to you. With the necessary tools, you can transcend the ranks of freelancing mediocrity. In the midst of chaos, you will thrive. In the heart of (business) war, you will conquer. For you are destined to be a true freelancing ninja. Great article Riyaz. Another useful tool for freelancers is 1DayLater time tracking – a simple to use time, expense and mileage tracking software.